I asked my Assistant Sarah to come up with a list of 100+ tasks she’s done for me. 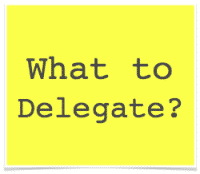 Too often Entrepreneurs LOVE the idea of a great Assistant, but then get stumped when it comes to actually delegating. Pretty tough to have an Assistant take over the bottom-80% of your workload, AND babysit those 317 projects you started last quarter, when you can’t even define the first five. Sarah’s overall list of 100+ tasks was huge and required a PDF. So I’ve included the first 20-30 below, and if you want the rest, just throw your name and email into the box below and we’ll email you the 100+ BEAST. For over a year Sarah’s been handling this for me. I’m amazed with how FREE I feel. It was excruciating to hand over the keys to the kingdom, but now I realize how silly I was being. Now I wish I woulda done it years earlier. Intellectually, you know your business needs systems, procedures, checklists. But anytime you’ve tried to start, it’s been excruciating and a waste of time. Good news: the right Assistant thrives on this kind of thing! Most Business Owners have a love-hate relationship with Infusionsoft. It’s powerful, BUT it’s got a steep learning curve that takes time to learn. It’s expensive. And if you have to hire someone to build and manage it for you, it’s gonna be $40/hr or more. But not anymore, Assistant to the rescue! As you can see, Sarah isn’t establishing the overarching strategy. Our marketing Manager and I still handle overall strategy, then Sarah takes that vision and builds it out in Infusion. You’ll also notice Sarah isn’t trained on 100% of Infusion. There’s really only about 3-4 tasks that make up 80% of Infusion work (probably: add a contact, setup a sequence, send an email broadcast). So Sarah started with just that. Then, as time went on, she picked up more and more skills on the fly. Now she can handle around 80% of Infusion, and virtually never gets stumped. That’s all just the tip of the iceberg.